When adventure calls for more, the Wilderness Systems Pungo 140 Kayak answers. Get the added speed and storage of a touring kayak, but with a spacious cockpit. 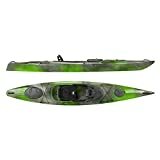 Ideal for larger paddlers.